This feature imports and exports scheduling commands in XML format text files. Imports scheduling commands in an XML format text file. When Asprova imports an XML file that contains objects that do not exist in Asprova, the result will depend on the setting of the property "Auto-generate object" of the property definition class. For example, in the case of "Target resource" of the property "Evaluation expression" of the scheduling parameter, if an XML file contains a resource named "Mixer" and the resource table of Asprova to which to import the XML file does not contain a resource of which the code is "Mixer", the resource object will be automatically generated when the property "Auto-generate object" is set to "Yes" for "Target resource" (ResEval_Resource), and the imported data will be ignored when the property is set to "No." That is to say, in the above example, the "Auto generate object" property in the property definition of the "target resource" (ResEval_Resource) is referred. Read-only properties cannot be imported. When trying to import, they will be ignored. Exports scheduling commands to an XML format text file. 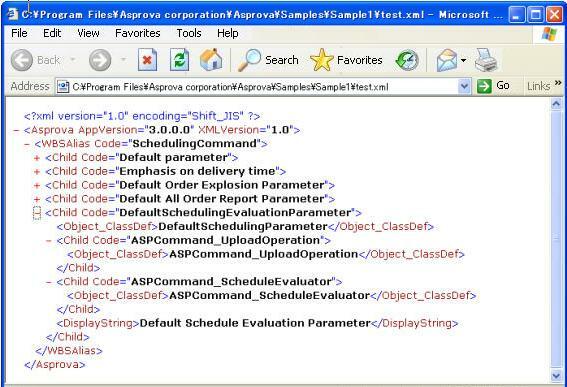 Selecting [File] - [XML Export] from the menu will save the entire scheduling parameters in XML format. If you select [XML Export] from the left part popup menu of the scheduling parameter table and so on, the commands you selected and those listed underneath the selected commands will be saved in XML format. If scheduling parameters containing expressions that have been saved with a name, such as dispatching keys, are exported to an XML file, the parameters including the names can be imported. Scheduling parameters that include expressions created in a project can be restored in another project, too. User registered expression <ME.Work_Order.Order_DisplayOrder> with the code <TestDispatchingKey01> was included in the import object, but there is already a user registered expression with the same code, so the code was change to <TestDispatchingKey01 (2)> before importing. You can jump from a message detail dialog to the expression table to view both expressions. To change a code or the like, you can do it from here. Since the user registered expression <ME.Work_Order.Order_Color> was imported not with the registered code <TestDispatchingKey01> but with <TestDispatchingKey11>, the user registered expression code was changed to <TestDispatchingKey11>. You can jump from a message detail dialog to the expression table to view the imported expression. The file format of an XML exported file looks as follows. Indicates the start of Asprova&apos;s data. A version of Asprova. This item can be omitted when an XML file is created in an external system. A version of Asprova&apos;s XML format. If this item is omitted, the XML version will be regarded as the latest. Describes the class to which the data relate. This item cannot be omitted. Currently, since you can only import/export scheduling commands, you will describe this item as follows. You can describe a property name in a tag (attribute). Example 1:The class is the assign manufacturing orders class. Example 2:Has a child named "Assign first processes". Reserved characters "<", ">", and "&" in XML "will be converted respectively to escape sequences "<", ">", and "&" in text files. You cannot use short names of properties. The event conditions object of a scheduling parameter is not owned by the parameter, but exists under a separate class root for event conditions. However for the purposes of XML export, event condition objects will be included in the XML as if they were a child of the parameter. When imported, event condition objects will be created for scheduling parameters even if there is an existing event condition object of the same name. ｷ From Ver. 15.0, if a command to be exported contains a reference execution command, it also recursively detects the reference scheduling parameter and exports it to an XML file as needed.